One of frustrating the parts of doing online genealogical research is relying on the sometimes faulty indexing of digitized records. I regularly find records that have been mis-indexed, but usually only after an extended search. All that is really needed is the ability to annotate or correct the online indexed records and then others searching for the same information would not have such a difficult time. In fulfilling this need, MyHeritage.com has introduced a sophisticated feature that allows users to correct mistranscribed or misspelled names in historical records on their SuperSearch™ program. 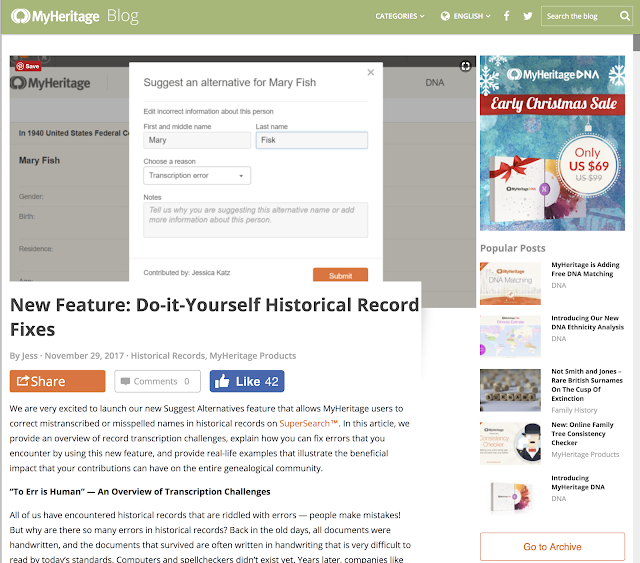 This new feature is announced and explained in detail in their recent blog post entitled, "New Feature: Do-it-Yourself Historical Record Fixes." This feature on MyHeritage.com is not only intended to "fix" transcription or indexing errors but also to correct information contained in the original document such as clerical errors on the part of the person who wrote the original record. This concept moves the process of indexing into a closer association with those who are doing research in original documents. In the past and as is also the case presently, indexing projects are conducted either by paid contractors or volunteers. The marvelous work done by these indexers has revolutionized genealogical research. But very very few of these contractors and volunteers are experienced genealogical researchers themselves. Adding a feature, such as the one introduced by MyHeritage.com, allows those who are actually involved in the research process to increase the reliability of the existing indexes. Obviously, the original record is not altered. The fix involves adding alternative readings of the record. What is most helpful is that MyHeritage.com automatically adds the alternatives to their search engine technology, SuperSearch™. Rather than reproduce the entire blog post, I suggest you read the original article linked above. A local newspaper just featured a front-page article on identity theft. This reminded me that I hadn't written on how this topic impacts genealogists for a while, at least for about a year. First of all, what is identity theft? The term itself is quite vague and used to cover a huge number of anti-social and some few criminal activities. 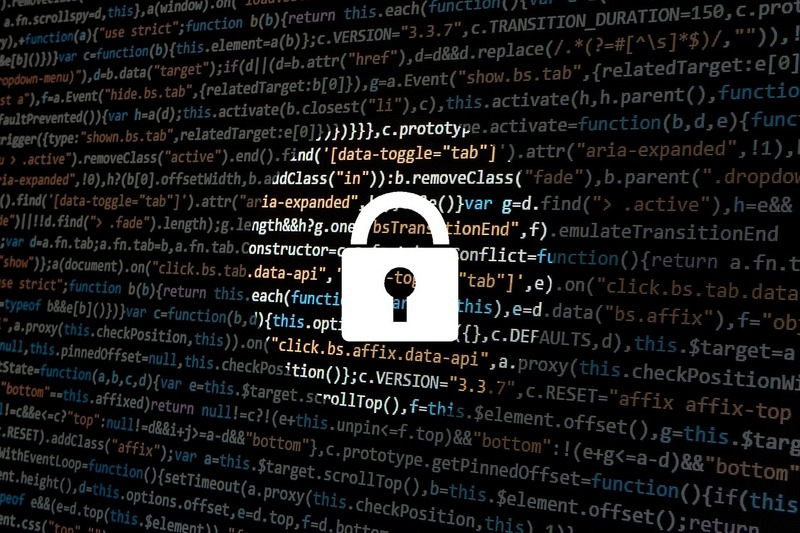 In addition, the idea of identity theft is usually raised any time there is a news report of a major computer hacking operation. The threat of identity theft is commonly used as a bogeyman to scare people by commercial enterprises who profit from people's fear, real or otherwise. Rather than ask "what is identity theft," I would ask if there is a commonly accepted definition at all? I would also ask if there are any statistics about the frequency of whatever is defined as identity theft and statistics on the actual damages suffered by "victims of identity theft." Knowing about these statistics when compared to the other dangers of our modern world, will go a long way towards establishing a basis for any needed action. In looking back at my previous posts on the subject, I am also interested to see if there are any updated statistics or changes in the definition of identity theft. Then, I need to evaluate whether or not participating in genealogy online raises the threat of having your identity stolen or whatever. First of all, you need to understand that all of the "statistics" about identity theft and any other related activity are based on complaints, not arrests and certainly not on criminal convictions. So, complaints, well-founded or spurious, are the real issue here. Here is a quote from the Federal Trade Commissions, Consumer Sentinel Network. NOW AVAILABLE: All consumer complaints filed with the FTC about financial issues, such as credit reports, debt collection, financial institutions, and lending. Unfortunately, all of these statistics are only available to approved organizations. So where do we go to find out about identity theft? OK, so reading this from 2014, you can see that 7% of the over 16 years of age population back in 2014 complained about identity theft (remember victims of identity theft is measured by complaints). of that 7%, 86% of the complaints involved credit cards or bank accounts. Only 14% of the 7% or .0098 or about less than 1% of the complaints involves losses of more than $1. About half of the 7% or about 3.5% suffered losses of over $100. Does this sound like a good genealogical research policy? It is also a good idea when attempting to verify any statistics, government or otherwise. Once again, are there any current statistics on the actual incidence of identity theft and is there a definition of identity theft? Javelin Strategy & Research is a research-based advisory firm that helps its clients to make informed decisions in a digital financial world. Our analysts offer objective, strategic and, above all, actionable insights and unearth opportunities to sustainably increase profits. Isn't this sort of like asking an insurance salesman if you need insurance or an attorney if you need legal advice? If you keep reading on their website, once again, the supposed statistics come from a survey. Now, if you think about it, if identity theft is theft then wouldn't there be some statistics about crime? Actually, it is quite a challenge to find actual crime statistics. The FTC is still using data from 2006 to 2008. See Frederal Trade Commission, Identity Theft and Data Security. So how about the FBI or the Justice Department? 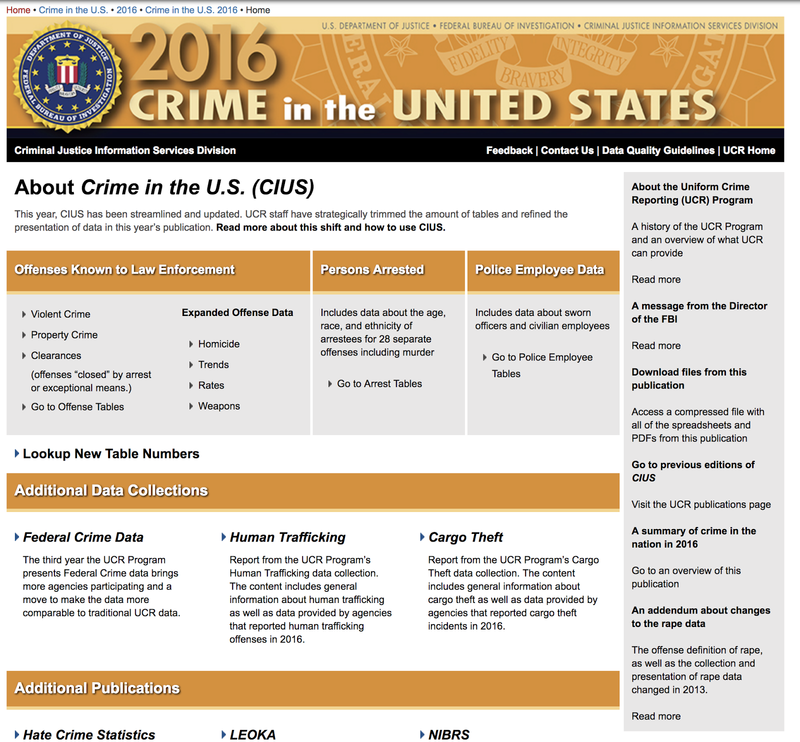 Where does "identity theft" fit into the crime statistics? 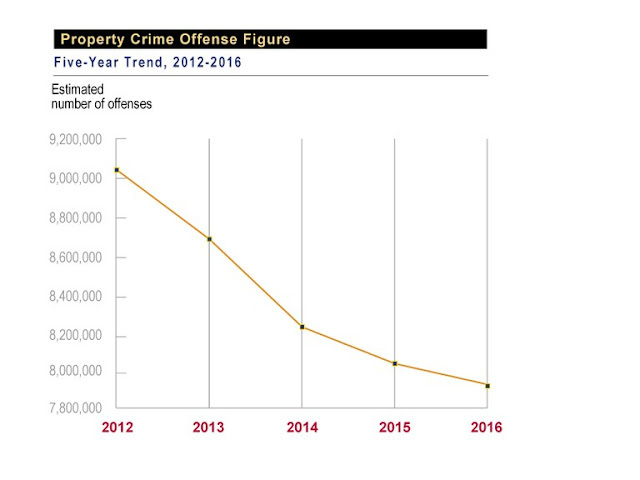 Oh, by the way, property crime figures are in dramatic decline in the United States according to the FBI. (m) a photograph or any other realistic likeness. (a) A person is guilty of identity fraud when that person knowingly or intentionally uses, or attempts to use, the personal identifying information of another person, whether that person is alive or deceased, with fraudulent intent, including to obtain, or attempt to obtain, credit, goods, services, employment, any other thing of value, or medical information. (b) It is not a defense to a violation of Subsection (2)(a) that the person did not know that the personal information belonged to another person. (ii) the use described in Subsection (2)(a) of personal identifying information results, directly or indirectly, in bodily injury to another person. (4) Multiple violations may be aggregated into a single offense, and the degree of the offense is determined by the total value of all credit, goods, services, or any other thing of value used, or attempted to be used, through the multiple violations. (5) When a defendant is convicted of a violation of this section, the court shall order the defendant to make restitution to any victim of the offense or state on the record the reason the court does not find ordering restitution to be appropriate. (iii) in attempting to remedy any other intended or actual harm to the victim incurred as a result of the offense. Once again, these numbers do not reflect arrests or convictions, they are reports to an online website. 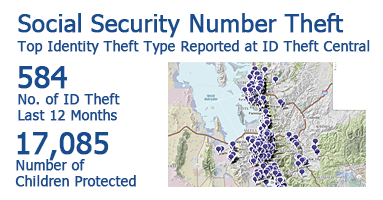 Going around the circle, remember that the Bureau of Justice Statistics on identity theft date back to 2014. The situation is that the term identity theft is used for everything from losing a credit card to elder abuse. Over the years since identity theft became an issue, there has been little or no consensus on the definition, there is no consistent measure of arrests and convictions, and there are statistics that show that all forms of property crimes are decreasing. Should genealogists be worried? Not any more than the general population. Should the general population be worried? No more than usual. We still need to be cautious about sharing personal information with anyone not obviously authorized and refrain from including information about living relatives online and continue to maintain reasonable personal security measures such as avoiding online fraud etc. What would be nice is if the banks would quit using relatives names and surnames as "security questions." How long will your genealogy last online? The last few days there have been a bundle of program and system upgrades on all my devices. Most of these are just a minor inconvenience, but sometimes they interrupt my workflow for a substantial period of time. These nearly constant upgrades also remind me that the preservation of my digital data depends entirely on keeping up with these changes. The issue here is called "data migration." 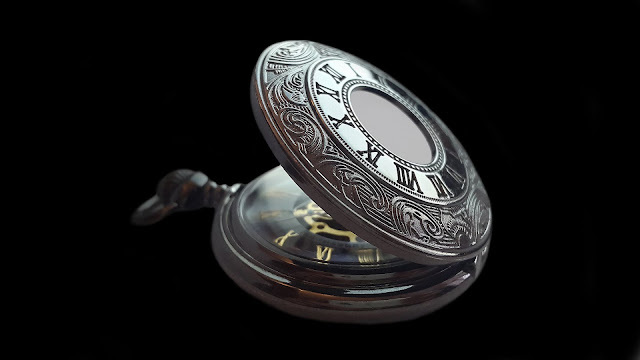 Over time, both computer hardware and software changes reflecting technological developments. Since the advent of the "personal computer" in the 1970s, there has been a steady loss of data as software and operating systems have been "updated." I am thinking of all of the floppy disks I have thrown away. I'm also thinking of the old hard drives that I have stored in boxes. In my case, I have tried to move the data as I have acquired new computers and new storage devices. As a result, I have a massive amount of data on my own devices. So this is not just an abstract issue for me personally. But what I do see, is a stream of people talking to me about their old files. Just in the last few days, I have had a conversation about genealogical records that were still in Personal Ancestral File format. I also know that I have old GEDCOM files on my computers today. When we talk about backing up our computer data we need to include the concept of data migration. Old computer files are just as permanently lost, in some cases, as files that are lost through physical destruction. One underlying issue concerning online file preservation also involves the concept of data migration. For example, most of the image files that we have today, including those containing genealogical information, are in the JPEG format. This JPEG format is as close to a universal file format as now exists. However, how long will that format be available? From a technical standpoint, computer programmers could write programs that would automatically transfer the data from one file format to another. However, there is a present example of new formats replacing the old. My new iPhone 8 plus is programmed to create a new file format for all photographs taken with the camera. This file format is called HEIC or HEIF and it has automatically replaced saving files in the JPEG format. When I download a photograph from my iPhone's camera, it is automatically saved in the new file format. However, very few of the programs that I presently have on my computer including Adobe Photoshop recognize the new file format. In order for me to use the files created, I have to use another program and transfer the HEIC or HEIF files into JPEG format. Speculating, what if the new file format replaces JPEG? What happens to all the old JPEG files? This is a real question. Interestingly, I do not presently find any way to transfer a JPEG file into a HEIC or HEIF file. See "What is HEIC?" By the way, there are hundreds if not thousands of different file formats. For practical purposes, most programs create their own unique file format. So abandoned programs often leave "orphan" file formats that cannot be read by any other program. There are a number of things, as genealogists, we can do to minimize the impact of these file changes. First of all, we can be aware of the fact that data migration is our own personal responsibility. We should all realize that preserving our genealogical data is a dynamic process that requires us to make changes over time. As we operate our computers, our programs, and our storage devices we need to be aware of the need to upgrade software and to migrate our data to newer programs. This is a constant background process. What will happen to your genealogical research when you die? None of us like to confront the inevitable end of our lives and genealogists are no exception. 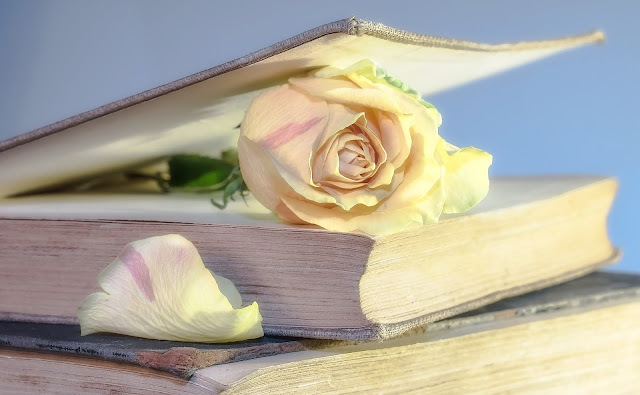 As I have written in the past, one of the constant background tragedies in the genealogical community is the constant loss of years of genealogical work when the researcher dies. The usual scenario is that the researcher has spent years accumulating files, documents, letters, photos and other background information about his or her family and all of that is lost when family members do not appreciate the work done. In extreme cases, all of the work goes into the nearest dumpster. Back in 2016, I did a webinar on this subject. But there is always more to say on this subject. The real issues here are a duplication of effort and a failure to communicate. There is also an underlying issue of failing to adequately prepare for the inevitable. To begin, there needs to be an honest evaluation of the value of both the information and the physical artifacts. Much of the work done by genealogists consists of copying historical records and information. However, some of the information obtained by research comes from contemporary sources such as memories of relatives. The researcher needs to distinguish between easily reproducible information such as a pile of photocopies and original documentation such as handwritten letters, certificates, diaries, journals and etc. There is a saying, one man's treasure is another man's trash. This is particularly true for the documents in such accumulated by genealogists. It is also complicated by the fact that some people collect everything. In going through inherited piles of documents, the biggest job has been separating the trash from the actual genealogically important items. Given the technology available today, it should be a priority to scan or otherwise digitize copies of everything. Of course, this simply raises the issue of the preservation of the digital files but to a great extent that can be resolved by storing files in an online repository such as FamilySearch.org's Memories. An old-school solution is to publish a book containing both the research and copies of important documents and photographs. This is an alternative assuming that the book finds its way into a library where it can then be digitized and further preserved. Once the book is in a library, it will likely be cataloged and the catalog entries made available through WorldCat.org. Preserving the physical documents is more problematic. In most cases, survival of the original documents probably relies on the good graces of the family members who inherit the items. Preservation of the physical documents and items by an institutional archive will depend upon a perception of their historical importance. Sophisticated researchers may be tempted to rely upon testamentary trusts or provisions in a will providing for the preservation of the work. In reality, I have yet to see this happen. Although, I know that it is a distinct possibility and that such provisions may exist. The problem with any testamentary document is that it still relies on the actions of the family members. Current probate actions rarely contain detailed inventories of the deceased property and even mentioning specific classes of property, i.e. documents photographs etc., will not ensure their preservation. The court would only be concerned if the documents at some monetary value. The real solution here is collaboration. Establishing strategic relationships with other genealogists should be a priority. It is a bonus when these genealogically inclined people are relatives because then they will have an additional motivation for assisting with the preservation of the documents left behind. For many years now, I have been digitizing records inherited from other family members and where appropriate, donating the original records to various repositories. One problem is that these documents and photographs sometimes seem to disappear but in most cases, they are discoverable in the catalogs of the institutions. This creates a real challenge for subsequent researchers because it requires a certain level of awareness and experience on the part of a future researcher to discover the archived items. The transfer is best accomplished when the entire corpus of the work done by the deceased researcher becomes incorporated in the subsequent work done by the person inheriting the information. Obviously, this does not happen very frequently. In short, there is no simple solution to the problem. Each individual circumstance is truly unique. This brings up Rule Seven: "Water and genealogical information flow downhill." The idea of Rule Seven is that over time, historical information disappears. The whole idea here is to work through some sort of methodology that will maximize the possibility that the genealogist's work is preserved in some format. If the core data is preserved, then the bulk of the problem with duplication of effort is minimized. This result is maximized by careful documentation and participation in online preservation efforts through sharing a family tree program such as FamilySearch.org where there is no maintenance fee required or access fee two subsequent researchers. I chose to make this video because I knew it might be the last for a while. I couldn't think of a more timely message than encouraging everyone to back up their data. The Brigham Young University Family History Library will keep producing outstanding genealogy-related videos, but I will be unavailable for a while. As of the date of this post, we have 336 videos online. We now have a number of videos that are available for viewing outside of our YouTube Channel thereby making them available for viewing directly in LDS Chapels. The BYU Family History Library began producing videos online back in 2014, just shortly before I moved from Mesa, Arizona to Provo, Utah. My first videos began appearing in July 2014, even before we became completely moved in to our Provo home. There are a number of fully capable and excellently prepared individuals who, I am sure, will carry on the tradition. The first live webinar we produced was the one entitled, "Why You Can't Trace Your Lineage Back to Adam" uploaded on March 4, 2016. The people making the videos are not all directly associated with the BYU Family History Library. Some of them are professors or staff from the University. Others are members of the greater genealogical community in Utah. We have quite a number of very experienced genealogical researchers and other experts in the genealogical community that have participated over the past three years or so. The number of views we get on YouTube is almost invisible compared to the most common instructional or entertainment-oriented videos on this particular venue. In a sense, however, we are not competing with all the other companies and individuals on YouTube. We are trying to provide a wide-ranging selection of genealogically pertinent topics. We have seen steady growth in our viewership and we thank our loyal viewers, especially those who have taken the time to subscribe to our Channel. I realize that YouTube is probably not the first place most people would look for genealogy-related content. But for those who learn and remember visually, these videos are a good way to gain important information. Even the short instructional videos on the Channel take the presenters hours of preparation and production. I estimate that each of my webinar videos has taken at least five hours of production time. Some of the videos have taken a shorter time but some have taken much longer to produce. My absence from the BYU Family History Library may be only temporary, but there will be plenty of other people who can provide quality videos over the time I am not available. Genealogists have an interesting relationship with cemeteries. For us, they are hardly the spooky places depicted in both books and movies. They are mostly a prime area for genealogical research and discovery. Boothill is a prime tourist attraction located in Tombstone, Arizona. It is also a real cemetery with actual graves. 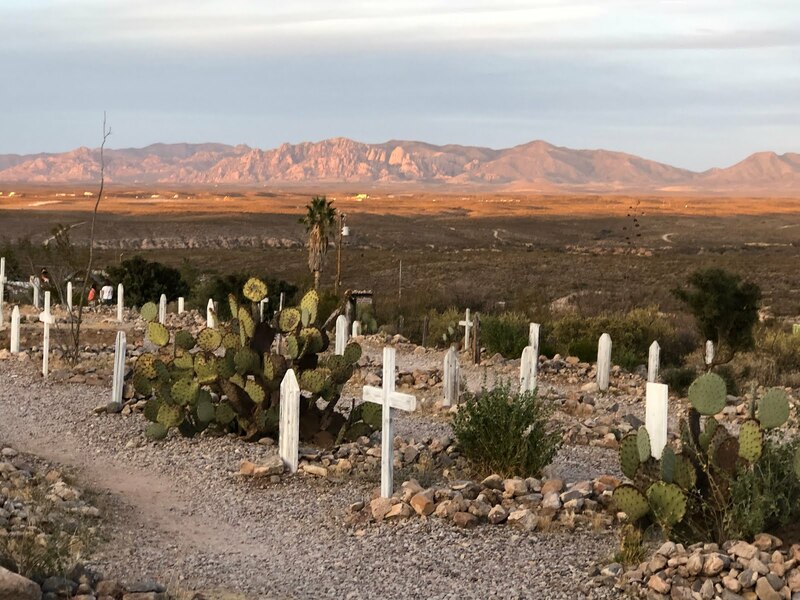 It is a typical, old, desert cemetery and is missing all the usual sorts of gravemarkers, grass, and trees associated with some cemeteries. 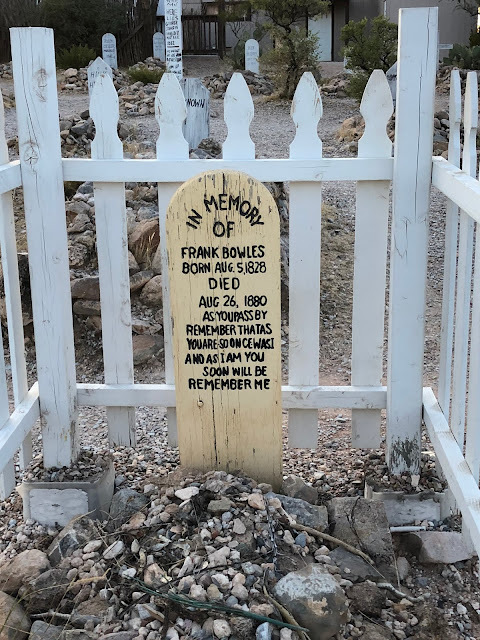 I have visited Boothill on several occasions over the years, but this time was different. While visiting the cemetery, I had my iPhone and decided to check out whether or not the cemetery was on BillionGraves.com. The Boothill Cemetery has several rather famous graves and these graves are all shown on the BillionGraves.com map. The map gives the visitor the convenience of being able to find the interesting graves without walking back and forth through the cemetery. However, these are all my own photos and not from BillionGraves.com. You might have to click on some of these photos to see the detail. Here is another famous burial. 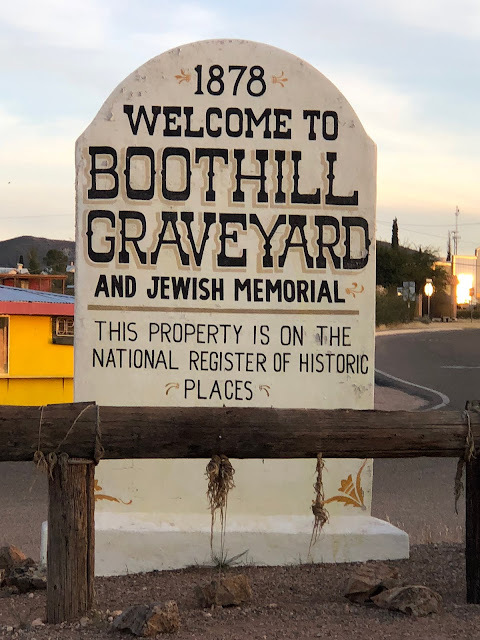 The most notable use of the name "Boot Hill" is at the Boothill Graveyard in Tombstone, Arizona. 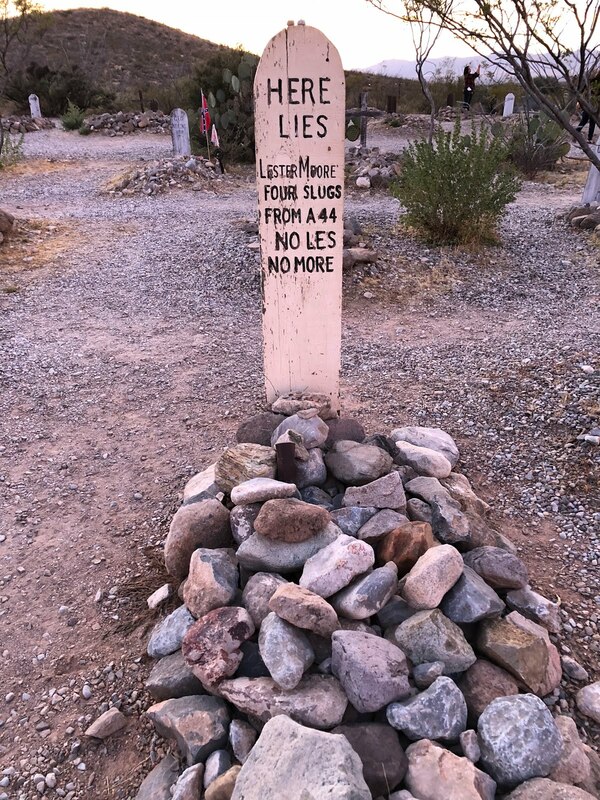 31°43′11.6″N 110°04′13.6″W Formerly called the "Tombstone Cemetery", the plot features the graves of Billy Clanton, Frank McLaury and Tom McLaury; the three men who were killed during the famed Gunfight at the O.K. Corral. Located on the northwest corner of the town, the graveyard is believed to hold over 300 persons, 205 of which are recorded. This was due to some people (especially Chinese and Jewish immigrants) being buried without record. There is a separate Jewish cemetery nearby with some markers restored, and there are also marked graves of Chinese. However, most of the loss was due to neglect of grave markers and theft of these wooden relics as souvenirs. 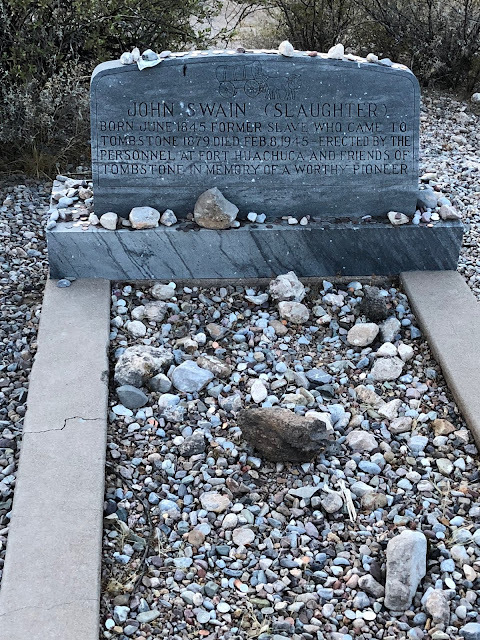 For example, when former Tombstone Mayor John Clum visited Tombstone for the first Helldoradocelebration in 1929, he was unable to locate the grave of his wife Mary, who had been buried in Boothill. The Tombstone "boothill" cemetery was closed in late 1886, as the new "City Cemetery" on Allen Street opened. Thereafter, Boothill was referred to as the "old city cemetery" and neglected. 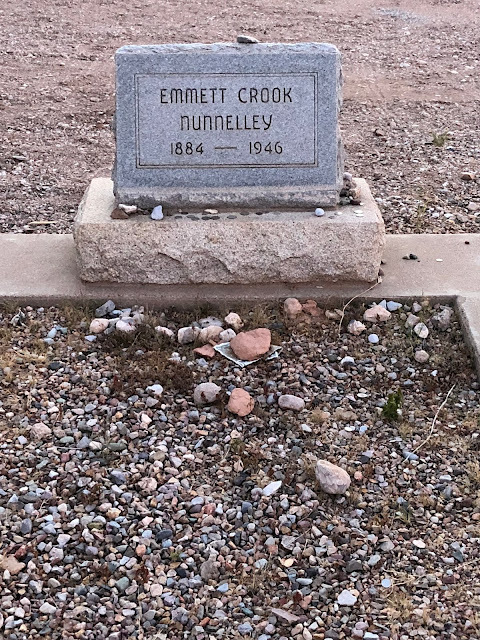 It was used after that only to bury a few later outlaws (some legally hanged and one shot in a robbery), as well as a few colorful Western characters and one man (Emmett Crook Nunnally) who had spent many volunteer hours restoring it. Currently, the Boothill Graveyard is open to the public for a $3 fee, and is a popular stop for tourists visiting Tombstone. Here is Nunnally's grave marker. John was born a slave. His mother was hired as domestic help by John Horton Slaughter, the famous western lawman and rancher. He became an expert tracker and excellent shot. Later he worked the mines around Tombstone until the boom ended. He was employed as the janitor of the Cochise County until 1931. He died in the Tombstone Hospital just over four months shy of his 100th birthday. See ArizonaGravestones.org. As is the case with any cemetery, you are likely to see the tragic as well as the interesting. Humans have been leaving mementos on and within the final resting places of loved ones almost from the beginning of the species. Excavations of even the earliest graves uncover goods meant to serve the deceased in the next world, such as pottery, weapons and beads. It probably has some of the same motivation for throwing money into ponds and fountains. 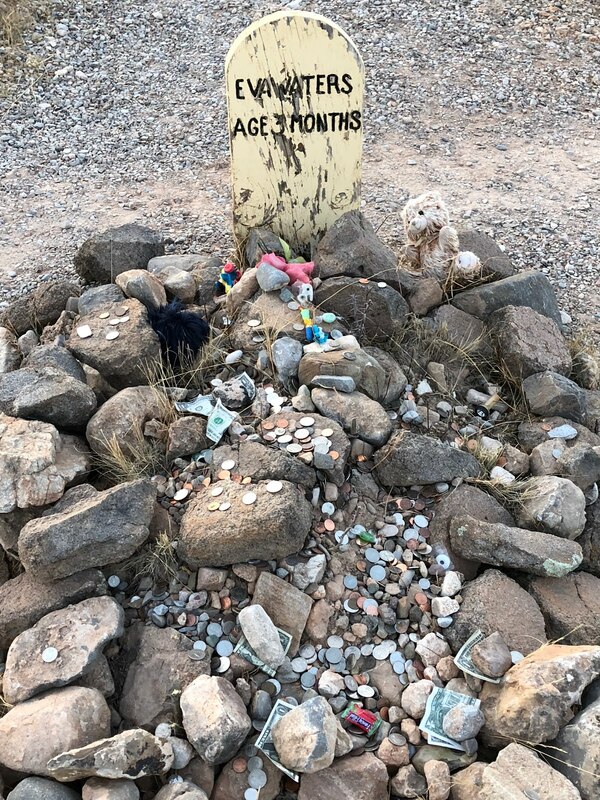 The money is not collected by the operators of the Cemetery and some of the coins and bills seem to have been there a long time. I guess I can never be "just a tourist." 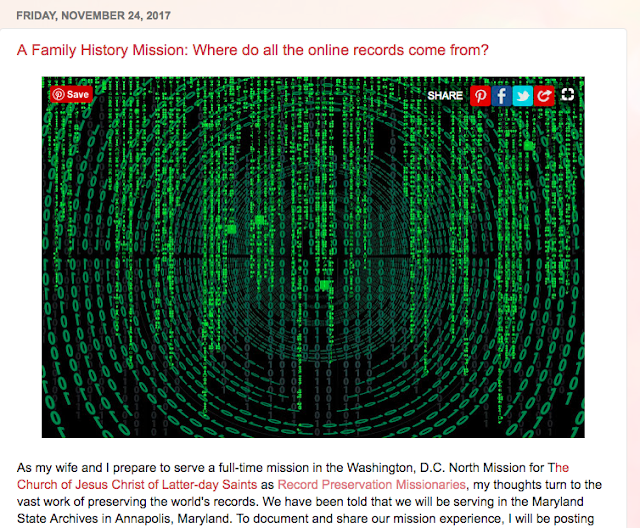 As my wife and I begin our year's service as Record Preservation Missionaries in the Washington, D.C. North Mission of The Church of Jesus Christ of Latter-day Saints, we will be sharing some of the events and comments about our mission on one of my other blogs: Rejoice, and be exceeding glad... We have decided since this blog is already available online and has an LDS or Mormon-based theme, that it would be most convenient and easier just to use this venue to "report" on our mission. As I have mentioned in previous blog posts, until we actually get involved in our missionary activities helping to digitize records at the Maryland State Archives, I will not know if or how often I will be able to post to any of the three blogs. Photos from the Washington, D.C. area will probably begin appearing on WalkingArizona along with selections from past travels. A surname book is the generic term for books about either an individual or family related to the author. There are likely more than a million of these books that have been published over the years. Genealogists often spend years compiling and writing one or more of these books. Sometimes, the books focus on the life story of author's parents or a set of grandparents. Often, they include a listing of the subject ancestor's descendants or ancestors or both. I have often encountered a general antipathy towards surname books among "serious" genealogists due to the narrative nature of the subject matter and a lack of substantiating documentation. My own family is well represented by this genera. One interesting phenomenon is that many, I would say nearly all of these books are "self-published" or contract printed. The authors often print up a certain number of copies with the expectation that their relatives will be interested in the book and help pay for the cost of printing. Then, when there is little or no interest, the piles of unsold books accumulate in garages and basements. Years later, the accumulation of books are either destroyed or given away. The motivation for researching, writing and publishing such a book is usually to preserve the memory of someone the author feels should be known to other family members. In some cases, where there are more affluent relatives, they are contacted about funding the entire project with a promise that their own family will receive prominent mention in the book. In the United States and I assume elsewhere, there is a substantial industry associated with promoting the publication of these books and related types of books. One well know such effort is the "Who is Who in America" series of books that is now in its 70th Edition. The two-volume set of these books cost $227.00. However, there are a number of genealogically related "publishers" who even offer to write such books for the client and then publish the results. When I was a child, from time to time, I would pull one of these books off the shelf in my home and go through it trying to figure out who my relatives were and finding out a little bit about their lives. It would be of some interest, I suppose, if I were to claim that my years of interest in genealogy had its inspiration from my encounter with surname books, but that would be far from accurate. I managed to inherit or otherwise acquire copies of most, if not all, of the books I had available to me in my youth and I sometimes refer to them for an opinion about some of the details of my ancestors' lives, but essentially, I join in the opinion that the information is unsubstantiated and in many cases inaccurate or misleading. One valuable part of the surname book tradition is the preservation of some documents and many photographs. I am not at all writing in an attempt to discourage the production of such books. My personal feelings about the books are entirely neutral and I laud the effort taken to preserve a small part of our collective history. Those who decide to write and publish such a work need to understand that their motivation is not usually shared by other family members. With the advent of electronic or ebook publishing, the cost of printing such a book has dropped considerably. However, despite this clear advantage in publishing and distribution, many of the authors want a "paper, hardbound, copy" of their book. I do have several suggestions, however, for would-be surname book authors. My primary suggestion involves basic genealogy: cite your sources. Every once in great while, I find a book with ample source citations. These books are extremely useful and represent a real advancement in knowledge about a particular family. At the other end of the spectrum are books written like novels with obviously contrived dialogue and details that sometimes contradict good sense and the historical context. I would also suggest that any would-be author of such a work give up the idea of making any kind of profit from the enterprise. If the author is fortunate enough to get donations sufficient to cover the cost of publication then they should feel more than justified in the production. But the fact that the author ends up with a lifetime supply of books in a basement or garage should not become a basis for condemning the family. As an alternative to spending the time writing and publishing an entire book about a particular ancestor or family, I suggest doing some serious research and publishing an ongoing series of shorter publications. A good example is the effort made by my daughter Amy to publish a family-centered blog called "TheAnestorFiles." Each of the short posts is accompanied by specific and extensive documentation. If a more organized publication is needed then parts of that publication are already researched and written, meanwhile, family members have access to the research as it is ongoing. In addition, as appropriate, the sections of the blog posts can be attached as supporting documentation to individuals in online family trees. Genealogy involves a great deal of family history. It is important to document and preserve traditional family stories. But it is equally as important to do well-documented research. I am reminded of a traditional family story in my own Tanner family. It has been passed down and retold to family members for almost 200 years. Many family members who have absolutely no interest in genealogy or family history can recount the story from their memory. Unfortunately, the original story was not well documented and there are differing accounts in the historical record of the details of the events. Even the origin of the story is questionable due to the fact that the earliest written account was written by a descendant who never knew or met his ancestor. I have written about this before and I am still hearing different versions of the story from my near and distant relatives. The entire story has been reprinted in a number of surname books, some of which still are available in boxes of copies that I inherited from family members and which are stored in my basement. From time to time, I am actually able to give away a copy of one or two of the books. We recently had some business to conduct at the Department of Motor Vehicles to replace a lost vehicle title. As we entered the building, I observed long lines of people waiting to have their photo taken for driver's licenses. I also had to present my driver's license for identification before I could talk to the clerk processing the replacement title. I also recall that during a recent trip to the bank, I had to present my driver's license before the bank employee would talk to me about my account. In driving down the freeway, I noticed a few cars stopped by the highway patrol due to an increased emphasis on enforcement over the holiday season. If you have ever been stopped, you know the first thing they ask for is your driver's license. There is also an automatic check on your car's license plate number and registration. The officer also routinely asks to see your insurance. When you applied for car insurance, you filled out a form with a lot of "personal" information including your social security number. I recently got a prescription refilled, and I had to give my date of birth to obtain the prescription. We live in a complex world society and identification of every individual is a fact of life. So what is and what is not "private?" What about genealogy? My bank still uses my grandparents' names for a second level verification for online banking even though this provides a trivial level of security. 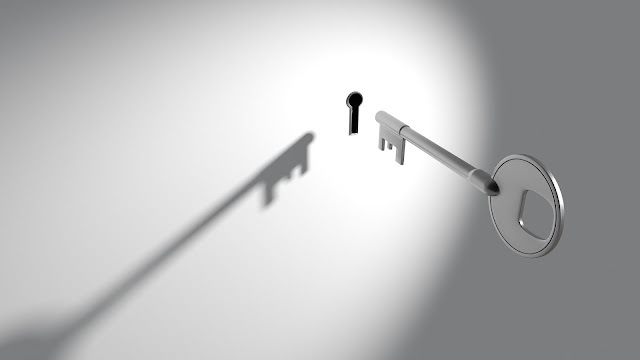 I have written about privacy dozens of times in the past and repeatedly pointed out the disparity between what is commonly believed and accepted about privacy and the reality of our society. If you really want privacy in the old, outmoded sense, you would have to avoid all forms of electronic communication including telephones. You would also have to give up driving or owning any form of titled vehicle. You would have to give up going to doctors or the hospital. You would have to avoid talking to or communicating with any of your relatives. You would need to avoid interstate travel and not make any purchases with credit cards. Even using cash to make purchases would mean you could make no major purchases. You would have to live somewhere that did not make use of any security cameras. Of course, you could not vote or ever express an opinion in writing. The list could go on and on. Guess what? You would have to give up doing any genealogy at all. The whole idea of genealogy involves making connections with your ancestors and relatives. Today, it involves a lot of online research. Even if you eschewed online research completely, you might still have to have a library card and a permanent address. The point is that all current interactions in our worldwide society require giving up some measure of complete privacy. The last time I checked, a Google search on my name and any associated term, such as genealogy, results in tens of thousands of results. On any given day, I probably spend anywhere from ten to fourteen hours online. I also spent 39 or so years doing "discovery" to support litigation in courts including the Federal courts. Essentially, the word "privacy" simply means there are some things I don't talk about. If you do genealogy in a vacuum, like I did for the first 20 years or so, you can get the impression that you are the only one interested in the subject. The reality is that all your research will likely be merely a duplicate of what has already been accumulated. Can you really believe that with millions upon millions of online family trees that you don't have at least one relative looking at the same family lines you think are so unique? It does not really matter where your family came from either. 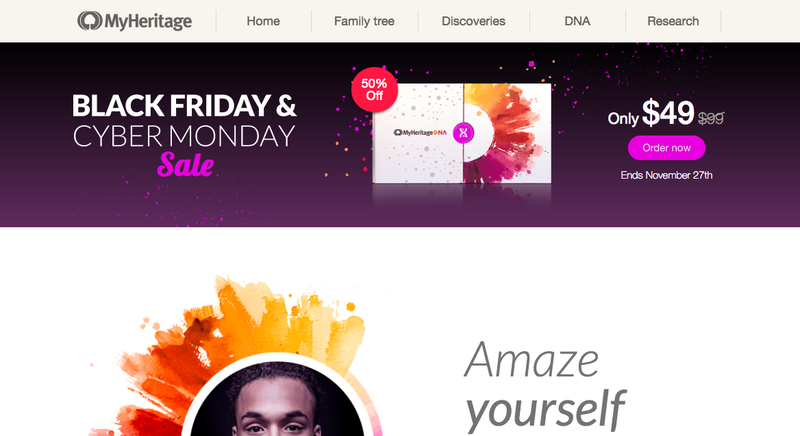 For example, MyHeritage.com has members in every single country of the world. The essence of genealogy is the idea of a shared heritage. "Private" family trees practically insure inaccuracy and duplication of effort. Genealogy is about making connections and the DNA testing is all about making, even more, connections than was ever before possible. Do we give up some "privacy" when we take a DNA test? Perhaps, but from my own perspective, nothing that is not already available online and easily obtained with the right connections and a willingness to pay for data. In my recent posts about DNA testing, I referenced newscasts that highlighted the use of DNA evidence in criminal investigations. With a little research, I found Ancesty.com Guide for Law Enforcement. You might also want to read, "Setting the Record Straight: Ancestry and Your DNA." The information from Ancestry.com shows that many of the uninformed online statements regarding genealogy, DNA testing, and privacy are pure fiction. If you read the news, you will realize that very few criminals are identified through DNA testing; far fewer than are identified from video CAMs now all over most developed countries. If you are a criminal or thinking about becoming one, you might want to stay away from DNA testing and genealogy altogether. Lastly, dead people have no rights to privacy. Period. Genealogy has always been part of my life. From the time I was a young child, I have heard stories about my ancestors. When I was very young, these stories centered around those ancestors who were "pioneers" and crossed the Plains to the western part of the United States. As I grew older, the stories became more specific and I learned about a series of books that had been written about various ancestors. I usually date the beginning of my genealogical research from the time I actually began looking at pedigree charts and adding and correcting information which was much later in my life. I am certainly not claiming that my family and my specific set of ancestors is in any way representative, but one thing I do know is that unless you are "interested" in genealogy or family history in more than a casual way, such as when I was much younger, you really aren't that aware of the codified stories of your ancestors. I used to give short tours of the Mesa FamilySearch Library that included looking at the huge collection of "surname books." The people on the tours we almost uniformly surprised to learn that there could be a published book about one of their ancestors. Over the years, I have observed that very few people outside of the active genealogical community are even aware that their ancestors may have left a record of their lives or that some descendant compiled a history or pedigree of an ancestor's descendants or progenitors. What is more interesting is that even if these people outside of the genealogical community have a copy of a book or manuscript, it is highly likely that they have never looked at it or read it. 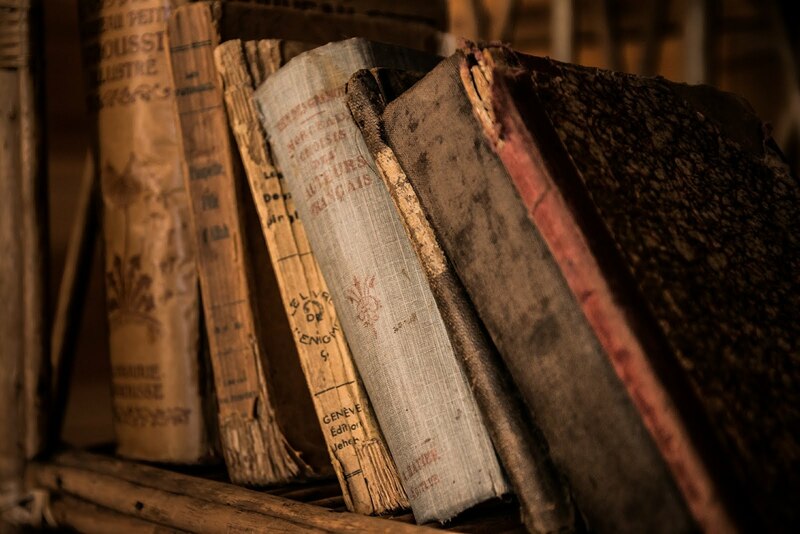 Even among the active adherents of genealogical research, there is a commonly held belief that "surname books" are unreliable sources for genealogical data. Likewise, biographies and autobiographies are also suspect. So why are genealogists so intent on either compiling or writing family histories? The reality is that these compiled histories are extremely valuable. The genealogists who compile such documents are personally the greatest beneficiaries of the process. Those who find the books and other records years after their publication also benefit from the effort. But what is usually the case, those who are directly related to the author usually do not have enough interest to even read the entire work. The main interest lies in those who are more distantly related; grandchildren, great-grandchildren and so on. If your only motivation in compiling a personal history is to benefit your immediate family, you may be disappointed at the results of all your work. But if you realize that your work will only become appreciated over time, you will see how that work will affect future generations that you may never have a chance to see or meet in this life. If you focus on your more distant descendants and families, you will not be disappointed at the lack of interest shown by your closer relatives. From my perspective, a true genealogist is not motivated solely by what others may think or how they may benefit from his or her work. A true genealogist is motivated more by involvement with the search and the pleasure of discovery rather than the expectation that someone will be benefitted. Some time ago, I wrote about Reclaim the Records' success in obtaining the New York Marriage License Index, 1908-1929 records from New York through a Freedom of Information action. Now we are seeing these records appear online, completely searched by MyHeritage.com's SuperSearch technology. Here is the announcement from MyHeritage about these new liberated records and others that are now available to those who subscribe to MyHeritage.com. You can read more about these valuable records on the MyHeritage Blog. 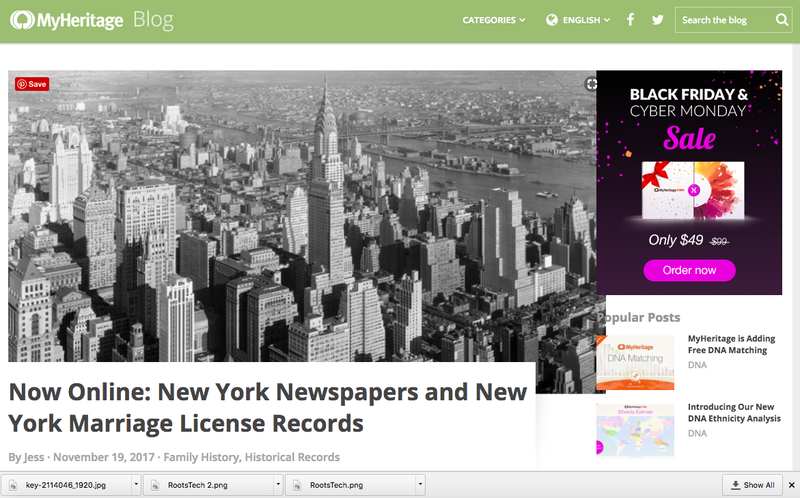 We’re happy to announce we’ve just added New York Newspapers, 1806–2007, and the New York Marriage License Index, 1908–1929 to SuperSearch™. Here is why each collection is important to your research and what you can learn about your family through these records. This collection includes more than 1.9 million pages of 56 newspapers published in New York State’s various cities and towns, dating back to the early-1800s. Historical information is included on celebrities and important 19th-20th-century events. You can find obituaries, birth, marriage and death announcements in newspapers, as well as important events and activities in the communities where your ancestors lived. Newspapers may also include previously unknown stories about both known living family members and ancestors. Some publications included in this collection are The Rochester Evening Express, Schenectady Gazette, The Newburgh News, Hudson Valley News, and more. These publications are rich with genealogical information about New Yorkers, historical events, and US national news. When you search this collection, all relevant local New York newspaper articles will appear in your search results and your keywords will be highlighted in each source. Every source will include the location of the publication, the date of the article, the language in which it was written, its periodicity, as well as the written text. You will then see the original newspaper article, which you can enlarge to full screen to read the print clearly. This collection is an index to marriage licenses filed at the New York City Clerk Offices from the five boroughs of New York from 1908–1929 and includes more than 1.5 million marriage license records. Each index record contains the given names and surnames of both bride and groom, the date of the license application, and the license number. While the records include all New York marriage license records from 1908–1929, year ranges vary slightly for Queens and Staten Island. In Queens, the marriage license records cover 1908–1930, and the Staten Island records are from 1908–1938. The images in this collection were obtained through the outstanding work and efforts of Reclaim the Records. Images are organized by borough, bride and groom, and then sorted alphabetically. We have linked the bride and groom together, when possible, using the license number. Marriage records contain important genealogical information about the bride and the groom, including their residence when the marriage occurred, birth dates, birthplaces, occupations and whether they were single, widowed or divorced at the time of marriage. Marriage licenses often contain information about the parents of the bride and groom, such as their names and birthplaces. Copies of the original marriage records in New York City are available for a fee from the Office of the City Clerk. All marriages that took place 50 or more years ago are classified as public documents and are available to all researchers. Any marriage that took place less than 50 years ago is restricted and only available under certain circumstances. Through Monday only, MyHeritage DNA kits will be available for $49 instead of $99. That's a whopping 50% off! They are also offering FREE shipping on orders of 3 kits or more. DNA testing as used in criminal investigations is very similar to the use of fingerprints and the testing for alcohol consumption. In the United States, there is a long line of court cases challenging all three types of tests. Subsequently, because of the court decisions, there are rules that criminal investigative agencies must follow when using any of the three types of evidence in court. Those rules are fairly strict and any deviation from the rules may cause the criminal prosecutors to lose their case and allow the suspect to go free. The current plethora of criminal investigation TV series would lead you to believe that the investigative agencies merely have to gather the "evidence" to have criminals convicted. These shows portray the investigative agencies as "solving" the crimes in the same way that detective shows used to do so in the past. Matching fingerprints, producing an alcohol test or matching DNA does not automatically produce a criminal conviction. For example, if you refuse to take a sobriety test, in most U.S. jurisdictions, you could suffer some severe consequences. Now, what could happen if you take a genealogically motivated DNA test? Well, if you are criminal, it would be the same as voluntarily giving your fingerprints to a law enforcement agency. So, if you plan on becoming a criminal, providing a DNA test falls into the same category. As I sort-of explained in my last post, even if you voluntarily give a DNA sample to a genealogy company, there is really no practical way the sample and the testing results could be used in a criminal prosecution absent another test done by the investigative agency that showed you were the one submitting the test. The reason is that when the genealogy DNA test is administered, there are no procedural controls over the way the test is conducted. You could have submitted someone else's DNA or even the DNA from your dog or cat. Of course, you might also have done the test correctly and the sample really is you. But that would have to be proven in a court of law. At best, an investigative agency might be able to use a matching DNA test from a genealogy company to make you a suspect in an investigation. But it is unlikely that the genealogical test alone would help to establish your guilt or innocence. It is much more likely that a criminal would have left some other sample of their DNA at a crime scene that would be used with a properly obtained sample after arrest than that the DNA would be used from a genealogy test. 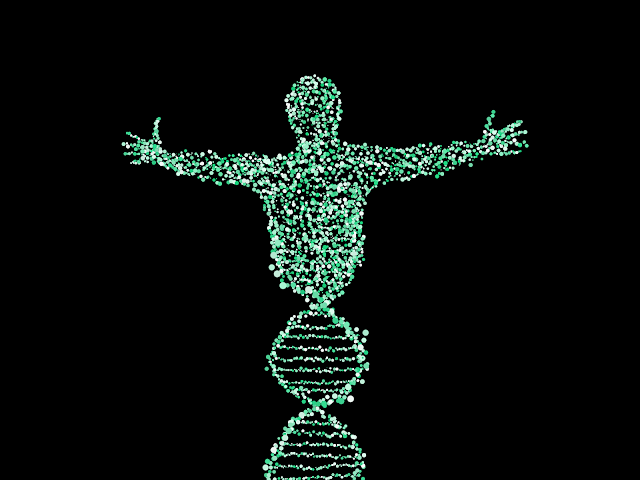 Is genealogically submitted DNA discoverable in a criminal investigation? 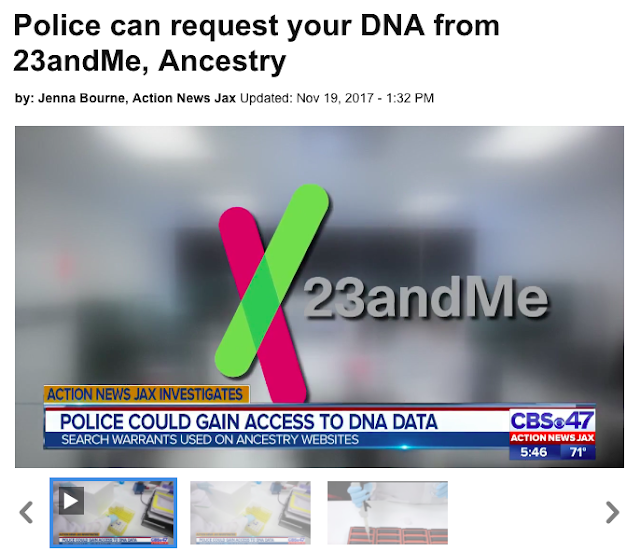 A lead online news article from Jacksonville, Florida CBS47, Fox30 Action News JAX, is getting some traction with the alarming headline that police could gain access to DNA data given to the large genealogical DNA testing companies such as 23andMe.com and Ancestry.com. As a 39-year veteran trial attorney, all I can say is well duh? What did anyone really expect? If you read the fine print when you voluntarily give a DNA sample for testing, say from Ancestry.com, you will see that you have agreed to that eventuality. However, there is a simple legal problem involved in using DNA samples from genealogy companies: how do they know you are the one supplying the sample? In order for physical evidence, such as a DNA sample to be used in a criminal prosecution, it must be proved to have an uninterrupted chain of custody. Here is an explanation of the chain of custody from the Office for Victims of Crime of the Office of Justice Programs, U.S. Department of Justice. That the evidence offered in court is the same evidence they collected or received. To the time and date the evidence was received or transferred to another provider. That there was no tampering with the item while it was in custody. A challenge in proving chain of custody can arise when service providers fail to properly initial and date the evidence or fail to place a case number with it. Since a DNA sample submitted for genealogical purposes is "collected" by the person submitting the sample, there is no real way to "prove" that the sample actually came from the person listed as submitting the sample to the company. The only way to prove that the sample is from a specific individual would be to retest the individual suspect. But let's suppose that in the course of a criminal investigation, the investigative agency (police is a rather non-specific term) decides to send the results of a DNA sample to one or more of the online DNA companies for a match. Could the investigative agency do this? Obviously yes. Especially if the agency obtained s search warrant from an applicable court. Could the company, Ancestry.com or whatever, be compelled to disclose whether or not someone in their database matched the agency's sample? Hmm. That is a little bit more problematical. Given the current status of the law, my opinion would be yes, but the agency might be required to pay for matching the test results. But then, the more important question is whether or not the agency could use the DNA test in a criminal case presented to the court? Now, we get to the issue of chain of custody. Who handled the DNA sample after it was submitted the DNA sample to the company? I can guess that the company has records after they received the sample, but there are no records about the time before the sample was sent. End of story. The news story is nothing but a really poorly sensationalized scare tactic to sell news. 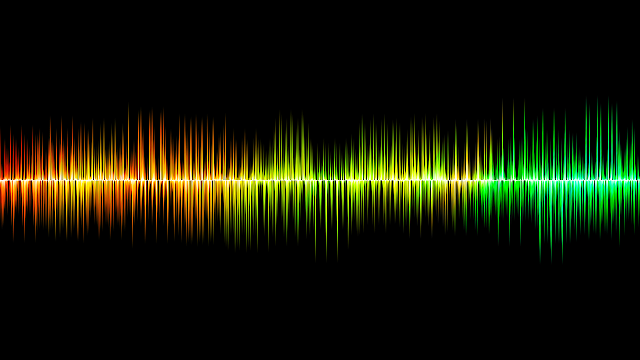 Voice recognition software: Boon or Bane? For me, functional voice recognition software has been one of most elusive goals of my many years' fascination with computers. I always dreamed that by talking, the computer program would magically convert my speech into text thereby creating a more effortless way to write. But the reality has always been far from the imagined goal. Until quite recently, the transcriptions from voice recognition or VR software have been cranky and most of the time more trouble than they are worth. From time-to-time over the years, I have written about my experiences with voice recognition software and now it is time, once again to return to the subject. The programs available today are just barely adequate. However, to achieve the present level of marginal functionality, both the hardware and the software had to reach a certain level of sophistication and speed that is only, just now, becoming available. If you want to use voice recognition software, I suggest you will need the fastest computer you can possibly afford and a relatively expensive software program and even then, the product will still be barely satisfactory. There are a number of different levels of voice recognition software in common use today. The most basic level, almost a toy, involves recognizing voice commands and some speech. Good examples of these types of programs are Apple's iOS program Siri and Google's Android program Assistant. These programs are designed to provide vocal interaction with a computer but provide only marginal text recognition. We use these programs for dictating short text messages and have a good time laughing at the mistranslations and mistakes. The next level includes programs such as the integrated voice recognition software in both the Apple MacOS operating system and Microsoft's Windows operating system. Both of these programs to an adequate level of recognizing the spoken word, but both have only very rudimentary editing capabilities. From my experience, most people are not even aware that their computer can transcribe speech into a variety of existing programs. The lack of basic editing capabilities renders these programs useless for other than casual note-taking. Many years ago, IBM initiated a program to develop speech recognition. This culminated in a program called Via Voice. Eventually, the program was evidently abandoned and the program was sold off to Nuance Software. Nuance has very slowly improved their VR programs over the years, culminating in programs for both Windows and Mac, now called simply Dragon but previously known as Dragon Naturally Speaking. Unfortunately, several of the low level, rudimentary programs such as Siri and Google Assistant, are touted as voice recognition software. If a program produces text that requires more time to edit than it takes to type by hand, then it is useless. That is the case with Apple, Microsoft and Google at this point in time. The following is an example of using Apple's voice dictation program to read this paragraph. Unfortunately,Several of the full level,Riddimentary program such as SiriAnd Google assistant,Are touted as a voice recognition software.If a program produces textThat requires more time toEditThen it takes to type by hand,Then it is useless.That is the case with Apple,MicrosoftAnd GoogleAt this point in timeThe following is an example of using apples voice dictation program to read this paragraph. As you can see, the program interprets commas as periods and messes up the word spacing. To go back and "fix" the dictation is a waste of time. If I wanted to actually use this dictated text or make modifications, I would spend an inordinately large amount of time doing so. I have a hard enough time editing what I write without throwing in a bunch of time-consuming errors. That brings us down to the only consumer-level product available today: Nuance's Dragon. First of all, it is a relatively expensive program. The Mac version is presently $300.00 and upgrades are usually nearly as expensive as re-purchasing the program. In addition, the program is buggy and needs to be restarted periodically to stop the program from adding in random characters. The Mac version bugs seem to persist over upgrade versions. But it is apparently almost the only game in town. In addition, to add insult to injury, the program is licensed to only one computer or device and so people like me who use two or three or more personally owned computers are limited to using the program on only one unless we want to spend another $300 to add another computer. Interestingly, the PC version starts at $59.00. During the past few months, I have been using Dragon on my Mac to write many of my blog posts. I am certain that no one could tell when I am using the software and when I am not. For me, the increased level of productivity and speed is worth the price, but I am surprised that there is not a little bit more competition out there. Voice recognition is becoming ubiquitous, but until the editing capability catches up with the recognition, the programs will not replace Dragon. One last note. There are a lot of different versions of Dragon on sale on Amazon.com. These are almost all older, even less useful versions of the program. Be careful when purchasing the program. 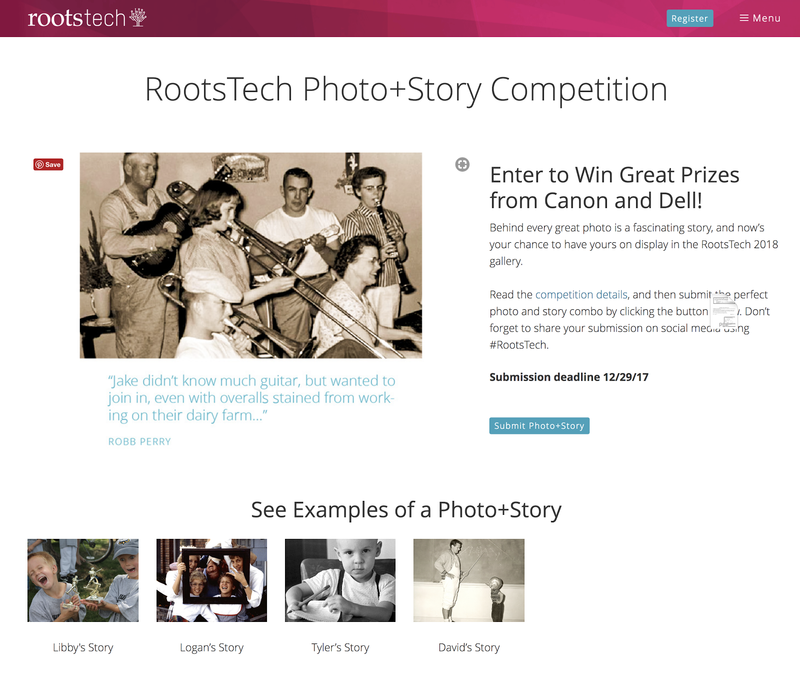 Read the competition details, and then submit the perfect photo and story combo by clicking the button below. Don’t forget to share your submission on social media using #RootsTech. See the link to the competition page above for details. How would you like to live in a condo built over a cemetery? 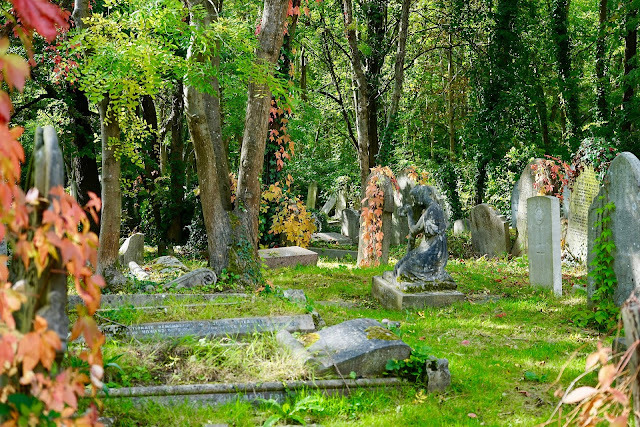 If you have ever unsuccessfully looked for burial information about an ancestor, you should realize that cemeteries and burial plots are not necessarily permanent. The above news story points out what can happen when a cemetery is on privately owned land. Even cemeteries that are owned by public entities such as towns or cities can be subject to changes in land development. In my own ancestral lines several of the graves turned out to be unmarked and in one case the grave was moved long after the person died. In the above case, the development company intends to move the graves.But this is not always the case. See "New website for Chicago and Cook County Cemeteries." In the above case also, think about the consequences of having the developer move the graves. What records might be available to show the new locations of the existing graves in the developed cemetery? This important understand from the standpoint of doing genealogical research, that any particular record concerning an individual may have either never been created or may have been lost. 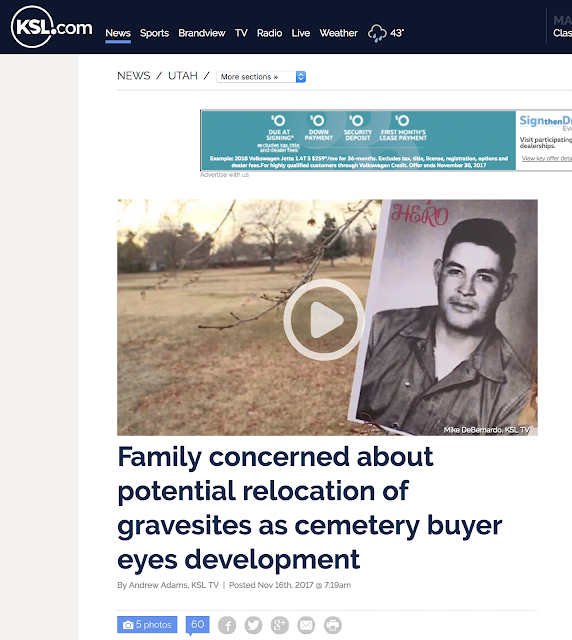 As I pointed out in the title to this post, how would you like to live on an abandoned cemetery site? By the way, you may be living on an abandoned cemetery site and not know it. 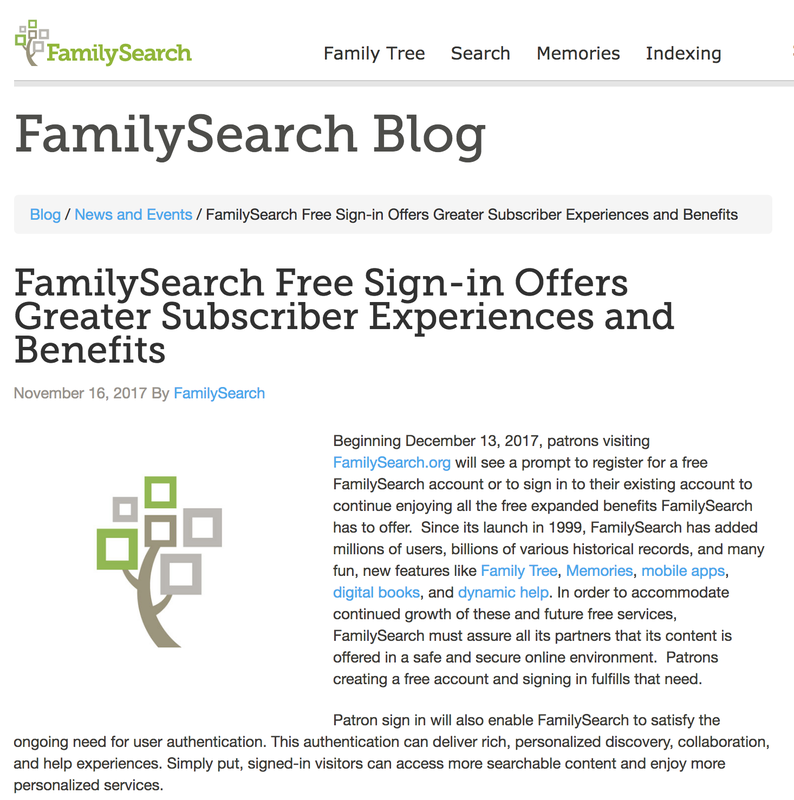 Beginning December 13, 2017, patrons visiting FamilySearch.org will see a prompt to register for a free FamilySearch account or to sign in to their existing account to continue enjoying all the free expanded benefits FamilySearch has to offer. Since its launch in 1999, FamilySearch has added millions of users, billions of various historical records, and many fun, new features like Family Tree, Memories, mobile apps, digital books, and dynamic help. In order to accommodate continued growth of these and future free services, FamilySearch must assure all its partners that its content is offered in a safe and secure online environment. Patrons creating a free account and signing in fulfills that need. The online world is rapidly changing as circumstances mandate a higher level of website security. Requiring all of the users to sign on will not change the user experience but it will help to preserve the integrity of the website. Angie was a teenage mother who placed her baby Meribeth for adoption in 1986. She never got to hold Meribeth after she gave birth to her, and she always hoped that she was adopted by a loving family. For thirty years, they both wondered about one another. MyHeritage DNA enabled Meribeth and Angie to finally find one another. 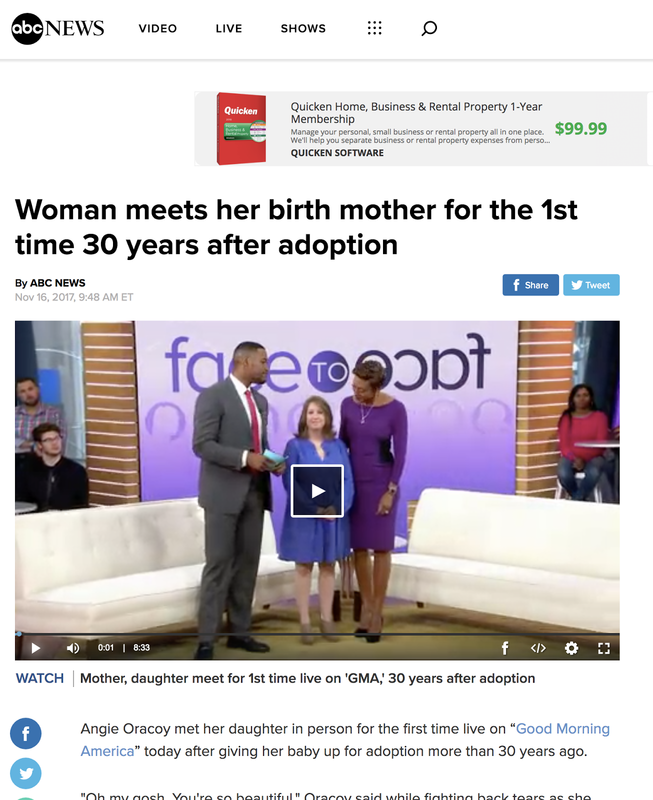 This is a remarkable illustration of the power of genealogically related DNA testing when coupled with a huge collection of online family trees. Is Reading Facebook a Royal Waste of Time? Wake up! Genealogy on Facebook?